Question: "Do the Orthodox believe in the Atonement?" The concept of atonement is found throughout Scripture, and so of course we Orthodox do believe in it. There was in fact a feast in the Old Testament called " The Day of Atonement," which in Hebrew is called Yom Kippur. This was the only fast day specifically called for in the Law of Moses, and was "a most holy sabbath [Shabbat Shabbaton]" (Leviticus 16:31). This is the fast that was alluded to in Acts 27:9, which states that "sailing was now dangerous, because the fast was now already past..."
The English word "atonement" was coined by William Tyndale, and means "to make one" or literally "at one-ment" (taking the two words "at" and "one" and adding the suffix "-ment." This well translated the meaning of the Hebrew word "Kippur," which means "reconciliation" -- specifically reconciling sinful men with a Holy God. Another term which William Tyndale brought into English is "Mercy Seat". William Tyndale based his translation on Luther's translation into German: "Gnadenstuhl," which literally means the seat of grace or mercy. However, there is nothing in the Hebrew term, Kapporet, which suggests "mercy" or "seat." "Kapporet" is a form of the word "Kippur", and literally means "the place of reconciliation". 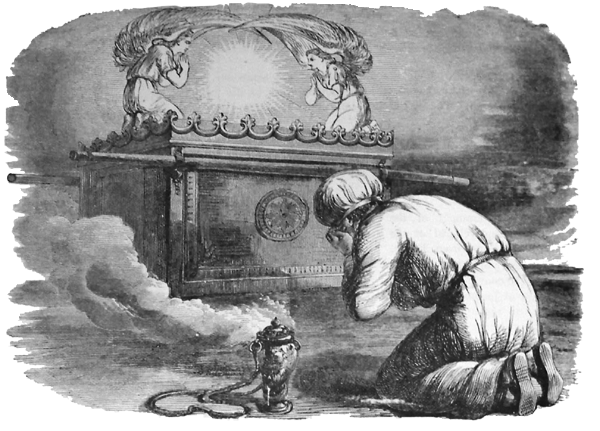 This was the lid of the Ark of the Covenant, and the Mercy Seat was the place upon which the blood of the sacrifice on the day of Atonement was sprinkled, and by which reconciliation between God and men was brought about. The Greek translation for Mercy Seat was "ἱλαστήριον, hilasterion." And we find this word used in Romans 3:24-25: "Being justified freely by his grace through the redemption that is in Christ Jesus: Whom God hath set forth to be a propitiation through faith in his blood, to declare his righteousness for the remission of sins that are past, through the forbearance of God." Interestingly we find in that text the word "redemption", which could be translated as "ransom", and the Hebrew word for "ransom" (Koper) is from the same root word as Kippur -- a word used in reference to the Old Testament sacrifices, and which clearly has the connotation of "payment." 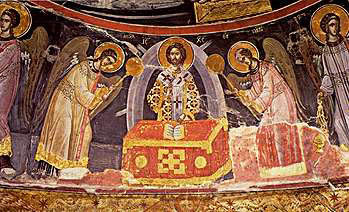 Church Tradition directly connects the Cross wih the Ark of the Covenant, because the Ark and the Mercy Seat was the place of atonement, and the Ark is referred to as "the place where His feet have stood" (Psalm 131:7 lxx) and the Cross is the place were Christ's feet stood, when he made atonement for our sins (see Christopher Veniamin, trans. Saint Gregory Palamas: The Homilies (Waymart, PA: Mount Thabor Publishing, 2009) p. 86). There are many contemporary Orthodox writers who wish to deny or downplay a number of concepts that relate to our redemption. They will argue we don't believe Christ had to die in our place, or that His blood needed to be shed to pay the penalty for our sins. They will deny the legitimacy of legal terms, in favor of the idea that the Church is a spiritual hospital. The problem is not that the Church is not a spiritual hospital, but rather that in emphasizing one set of images used to explain our salvation, they deny a whole set of equally valid images that are clearly Biblical. It is true that in the west there was an over emphasis on legal imagery, but the solution to such an imbalance is not a new imbalance in the opposite direction. We can and should speak of sin as an illness, but when we die, we do not go before the final medical exam -- we face the final judgment, which is a legal image if ever there was one. And so we can also speak of sin as a transgression of the Law of God, and of our need to be justified by God, even as we speak of sin in terms of an illness that we need to be healed of. We reject the idea that Christ's death was a ransom paid to the devil, but that it was a ransom in some sense is confirmed by the Lord Himself, and elsewhere in Scripture (Matthew 20:28; Mark 10:45; 1 Timothy 2:6). So we simply have to understand that verbal images point to a reality, but are not the reality itself, and we get a better idea of that reality by considering all the Biblical images that point to it -- not by focusing on one or two to the exclusion of the rest, and certainly not by pressing those images beyond the point that they are intended to make. As is often the case, the proper Orthodox perspective on this question is one of balance. We should proclaim the whole counsel of God (Acts 20:27), and not just the parts that we find most appealing. Nor should we overreact to the imbalances of heterodox theologians, and thus fall into a new error, by rejecting important aspects of our Tradition. "God allowed his Son to suffer as if a condemned sinner, so that we might be delivered from the penalty of our sins. This is God's righteousness, that we are not justified by works (for then they would have to be perfect, which is impossible), but by grace, in which case all our sin is removed" (Commentary on 2 Corinthians 5:21, quoted in Ancient Christian Commentary on Scripture: New Testament, Vol. VII, Gerald Bray, ed. (Downers Grove, IL: Intervasity Press, 1999) p. 252). "The Lord Christ is the propitiation of the Father for our sins, because praying to the Father for us sinful bearers of flesh, He points out His wounds for our sake, on His Body, the human body, which was sinless on earth, and forever remained that way. He is the propitiation of the Father for the sins of the whole world, because for the sake of all, and in the place of all, and in the name of all, He bore countless sufferings from the cradle all the way to the death on the Cross, the ultimate sacrifice, and He bore it in His infinite love of man. If it were not for the salvific propitiation for the sin of mankind, the world, by God’s righteousness, would have been destroyed many times because of its sins" (Archimandrite Justin Popovich, Commentary on the Epistles of St. John the Theologian, trans. Radomir M. Plavsic (Alhambra, CA: Sebastian Press, 2009) p. 21). Question: "I was wondering about the Sign of the Cross. What is its significance? Why is it performed when it is? When is it preformed besides after a prayer?" Making the Sign of the Cross is perhaps the most common act of piety Christians engage in throughout the day, and this is a practice of Apostolic origin. We do it to remind ourselves of the Cross that was the means of our salvation, and the Savior who was crucified upon it. It is the first thing we do at the beginning of the day, and the last thing we do when we lay down to sleep. we do it before we begin any task, and when we conclude it. We make the Sign of the Cross when we are in danger or tempted, and in thanksgiving. By making the Sign of the Cross with reverence, we are strengthen by the power of the Cross, and we confess our Faith in Christ to the world. On the feasts of the Cross we sing the hymn "The Cross is the guardian of the whole world! The Cross is the beauty of the Church! The Cross is the strength of kings! The Cross is the support of the faithful! The Cross is the glory of the angels and the wounder of the demons!" St. Athanasius the Great, for example wrote: "demons used to deceive men's minds by taking up their abode in springs or rivers or trees or stones and imposing upon simple people by their frauds. But now, since the Divine appearing of the Word, all this fantasy has ceased, for by the sign of the cross, if a man will but use it, he drives out their deceits" (On the Incarnation of the Word, 47:2). St. Cyril of Jerusalem said: "Let us not then be ashamed to confess the Crucified. Be the Cross our seal made with boldness by our fingers on our brow, and on everything; over the bread we eat, and the cups we drink; in our comings in, and goings out; before our sleep, when we lie down and when we rise up; when we are in the way, and when we are still. Great is that preservative; it is without price, for the sake of the poor; without toil, for the sick; since also its grace is from God. It is the Sign of the faithful, and the dread of devils: for He triumphed over them in it, having made a shew of them openly; for when they see the Cross they are reminded of the Crucified; they are afraid of Him, who bruised the heads of the dragon. Despise not the Seal, because of the freeness of the gift; but for this the rather honour thy Benefactor (Catechetical Lecture 13:36). Much more could be said, but others have already covered very well. For more details on when the Sign of the Cross is made, this is covered extensively in the Jordanville Prayer Book, in an appendix entitled "How One Should Pray in Church." You can purchase a copy by clicking here (and it is an excellent prayer book to have anyway). But a good way to learn when to make the sign of the Cross during the services is to pay attention to what everyone else is doing during the services, and emulate what you see, especially with regard to those who you know are regular and pious members. Question: "Is it proper for a parish to have altar girls?" This is clearly contrary to the Tradition of the Church, and is an unfortunate example of creeping modernism that it is tolerated in parishes anywhere -- but thankfully it is still fairly rare. It is certainly true that there is not an absolute prohibition against women entering the altar when there is a need for it, and in convents, it is common to have nuns serve in the altar, because obviously in a convent there are not a lot of males available for serving in the altar. However, this is done because it is necessary, not because it is "fair" or to give the nuns "something to do" during the services. See: The Churching of Boys vs. the Churching of Girls for more on that subject. Why is this the Tradition? We are not always given a list of justifications along with the Traditions that the Church has handed down to us, and so in this case, one cannot point to the official reasons for it, so far as I am aware. However, where the Tradition is clear, we should simply follow it out of obedience. As St. John Chrysostom put it: "Is it Tradition? Seek no further" [Homilies on the Second Epistle to the Thessalonians 4:2]. Traditionally, clergy are generally drawn from those who first served as altar servers. Altar servers were once classified as minor clergy, and it is still the case that before one is tonsured a reader (which is called "the first degree in the Priesthood" in that service), the individual being tonsured is first made a "taper-bearer" (or "candle-bearer," i.e. an acolyte). Readers, subdeacons, deacons, priests, and bishops have always been men, and so it makes no sense to have "altar girls" entering into a path that they could not follow. Of course those who oppose this Tradition would at this point ask, "What about deaconesses?" The office of deaconess was never a female equivalent of deacon. It was a ministry that existed for women, and the primary liturgical function they had was to perform the baptisms of adult women at a time when adults of both sexes were baptized naked. Because adults were baptized naked, women and men were not baptized together, and when women were baptized, the deaconesses performed all the functions a priest would otherwise perform, and a priest would say the prayers behind a screen. When Christianity succeeded in gaining at least nominal adherence from most of the people in the countries in which it existed, adult baptism became rare, because most people were baptized as infants, and so the office of the deaconess ceased to have a need to fulfill, and gradually disappeared. Though in our time, adult baptisms are very common, the practice is no longer to baptize adults naked. See: Voices from St. Vladimir: Deaconesses, which is a conversation between Fr. Chad Hatfield and Fr. Lawrence Farley on this subject. You may also want to read Fr. Lawrence Farley's book on the subject: Feminism and Tradition: Quiet Reflections on Ordination and Communion. The next question that one may ask is why only men can be ordained as clergy. Again, we first must simply say that this is the Tradition of the Church. Furthermore, the notion that this is based on cultural prejudices of the time of the Apostles, and that perhaps it never occurred to Christ or the Apostles that women might be ordained is belied by the fact that pagan priestesses existed not only during the time of the Apostles, but also throughout the history of Israel. So clearly Christ and the Apostles made a conscious decision that clergy would be males only. This is not because women are not smart, or capable -- because obviously they are -- but because they have other roles to fill. Being a priest is a fatherly role... which is why priests are called "Father". There are also motherly roles in the Church, and women fulfill them. Then there are roles that are open to "whosoever will," and women fulfill those roles too. And we as families and as a Church need to encourage men to fulfill those roles which are in fact fatherly. Women tend to be more pious than men, speaking generally. Often at lesser attended weekday services, I am reminded of the women at the Cross of Christ, because when I look out at the congregation, I might see the occasional "John", but the women almost always outnumber the men by rather large margins. Men need to be encouraged, especially by women, to take up their responsibilities as spiritual leaders in the home and in the parish. Of course many in our politically correct culture will immediately react to any suggestion that there is a need for male spiritual leadership, but there is empirical data that demonstrates that this is simply a fact of human nature, as God created it. Male participation in the Orthodox Church is generally better than most, but we need to work harder to encourage men to step up to the plate and take on their responsibilities as pious laymen, husbands, and fathers (See: Why Orthodox Men Love: Many men may not love church, but Orthodox men do, by Khouriah Frederica Matthews-Green). What then should girls and women do during the services? The same thing that men who are not serving in the altar or singing in the choir should be doing -- praying, and worshiping God. That is the first and most important task that we come to Church to perform. And it is not such a small task that one should need something else to do. But some parishes do have some roles they assign to young girls, such as tending the candle stands, or serving the zapivka after the faithful receive Holy Communion. They can also sing in the choir -- and in fact the choir serves a more crucial role than the altar servers, because while a priest can serve without an altar server, if he must, he cannot serve without at least one chanter. If ever there was a human being (aside from Christ Himself) that was more worthy of any honor the Church could bestow, it would be the Virgin Mary, and yet she was never ordained to serve a priestly role in the services of the Church. However, while she did not preside over the celebration of the Mystery of the Eucharist -- she played a rather crucial part in the Mystery of the Incarnation of Christ, which made the Eucharist possible. Motherhood (both natural and spiritual) is a great honor and a thing of incredible power, beauty, and worth. Fatherhood (both natural and spiritual) is not a better thing, it is simply different. As most of us have noticed, men and women are different, and our roles are different, but they are complementary. Neither is possible without the other, and both depend on the strength and support of the other. And so we should not allow ourselves to be talked into blurring the lines between the two by a culture that is on a self destructive trajectory, and which has only managed to rob both men and women of the virtues of their sexes. See also: Stump the Priest: The Priesthood. Update: On Facebook I was asked why a women cannot fulfill a clerical role? "When there are no men who know how to read the Epistle at a service it often happens that a women does read it. I would imagine in a convent, if a bishop came to serve, you might also have some of the nuns doing some of the functions of a subdeacon. It is certainly not that women could not perform the tasks in any in terms of their ability. But if you have a normal size parish, the percentage of people serving in the altar are a small fraction of the total. I think these functions are reserved for males, because men need to be encourage to step up to the plate of spiritual leadership, as I mentioned in the article. I have seen Protestant Churches were there are almost no men that attend. It is only women and children, and the Pastor... and in some cases the Pastor is a woman too. Men need women to encourage them to fulfill active, and positive roles, or else men will shirk responsibility and engage in only negative and destructive behavior." "In my secular job, I am a Child Support Officer, and so I see this phenomenon on display on a much wider scale than in the context of the Church. I have also seen comments from the fathers that confirm the generalization that women tend to be more pious than men. That does not mean that men cannot be pious or that women always are. But if you take a look at the article I linked to on the Swiss study, it is just a fact that male spiritual leadership is needed. Women often fill the role of spiritual leader in a family because the father is not there, but they also do so in many cases because the father will not step up the plate. They need to expect men to fulfill that role, and encourage them to do it. This should begin with their mothers, and should continue with their wives." "I am so glad to hear a man say that, Fr. John! I've said that myself & received considerable flack. I was once in a parish where a few women did everything except serve in the altar. I once saw the priest ask 3 men to help him serve in different aspects...just small & short tasks one of which was to hold the communion cloth. All 3 refused stating that we women could do it. One commented that women should be allowed to serve in the altar if the men did not want to & since the priest was not willing to allow us to do that, then the priest obviously did not really need the help. Another even stated that as far as he was concerned, his "duty" to the Church was done when he dropped his check into the offering box. The third stated that he came to Church to relax, not to "work". Ironically, a 7-yr old boy who had never served volunteered immediately showing himself to be the real man of the group. Overall, the whole day was extremely sad." Question: "Does the Orthodox Church teach that the Septuagint is more reliable than the Hebrew text of the Old Testament. If so, why is that?" In the "Encyclical of the Eastern Patriarchs" of 1848, which was a reply to the epistle of Pope Pius IX, "To the Easterns," the Patriarchs of Constantinople, Alexandria, Antioch, and Jerusalem, along with the other assembled bishops stated: "Our Church holds the infallible and genuine deposit of the Holy Scriptures: of the Old Testament a true and perfect version, of the New the divine original itself." 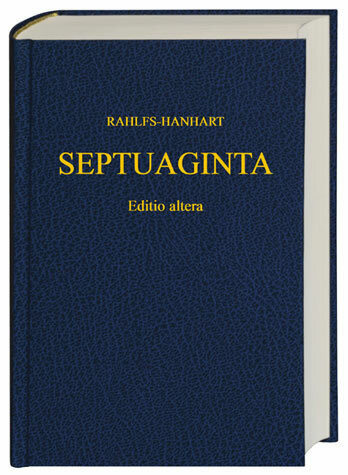 And so we have always held that the Septuagint is the authoritative version of the Old Testament. "...the basis of the Old Testament text in the Orthodox tradition is the Septuagint, a Greek translation by the "seventy interpreters" made in the third to second centuries BCE for the Alexandrian Hebrews and the Jewish diaspora. The authority of the Septuagint is based on three factors. First of all, though the Greek text is not the original language of the Old Testament books, the Septuagint does reflect the state of the original text as it would have been found in the third to second centuries BCE, while the current Hebrew text of the Bible, which is called the "Masoretic," was edited up until the eighth century CE. Second, some of the citations taken from the Old Testament and found in the New mainly use the Septuagint text. Third, the Septuagint was used by both the Greek Fathers of the Church, and Orthodox liturgical services (in other words, this text became part of the Orthodox church Tradition). Taking into account the three factors enumerated above, St. Philaret of Moscow considers it possible to maintain that "in the Orthodox teaching of Holy Scripture it is necessary to attribute a dogmatic merit to the Translation of the Seventy, in some cases placing it on equal level with the original and even elevating it above the Hebrew text, as is generally accepted in the most recent editions" (Orthodox Christianity, Volume II: Doctrine and Teaching of the Orthodox Church, (New York: St. Vladimir Seminary Press, 2012) p. 34). And in the above quote, I think there may be a translation problem, though I don't have the Russian text, and my Russian would probably be too limited to tell for sure by myself -- but when it says "some of the citations taken from the Old Testament and found in the New mainly use the Septuagint text," it is awkwardly worded enough for me to guess that Metropolitan Hilarion meant to say that most (not just "some") of the quotes of the Old Testament in the New Testament are based on the Septuagint... because as a matter of fact, that is true. "...it is clear why the Church prefers the Septuagint and Peshitta translations for the authoritative text of the Old Testament, and principally the first, for the Septuagint text was produced under the inspiration of the Holy Spirit by the concerted effort of the Old Testament Church" (The Law of God: For Study at Home and School (Jordanville, NY: Holy Trinity Monastery, 1994) p. 440). “Yea, ye took up the tabernacle of Moloch, and the star of your god Remphan, figures which ye made to worship them” (Acts 7:43, KJV). "You also carried Sikkuth your king and Chiun, your idols, the star of your gods, which you made for yourselves.” (NKJV). "But you carried a tabernacle for your Moloch, and the image of your idols, the star of your god, which you made to yourselves” (Douay-Rheims translation of the Vulgate). “Yea, ye took up the tabernacle of Moloch, and the star of your god Raephan, the images of them which ye made for yourselves” (Sir Lancelot Brenton translation of the Septuagint). Also, there are several sections of the Hebrew text that are simply unreadable without keeping one eye on the Hebrew text and one eye on the Septuagint. For example, if you look at the footnotes for the book of Habakkuk in the NRSV there are 5 places in which it states that the Hebrew text is uncertain, and 3 times in which they state that they are simply translating from the Septuagint, Peshitta, and/or the Vulgate, because the Hebrew text is so unclear. The Masoretic text simply makes no sense, and obviously at some point a scribe skipped an entire line or two of the text. This is obvious because of the reference to the Urim and Thummim, which were two objects used by the priest of the Old Testament for discerning the will of God on matters such as that described in 1st Samuel 14. Another example is the text quoted in Hebrews 1:6 (“And let all the angels of God worship him”) which is nowhere to be found in the Masoretic text, but is found in both the Septuagint and the Dead Sea Scrolls Hebrew text in Deuteronomy 32:43. It should be pointed out that the Hebrew text should not be ignored entirely. Particularly when the Septuagint and the Hebrew text are in agreement, we will better understand the Septuagint as a translation if we compare it with the Hebrew text that it is clearly a translation of. It is extremely helpful to understand the range of meaning of the original Hebrew text (when we clearly have it). For example, it is helpful to know that Hebrew does not have a past or future tense, but only a perfect and imperfect tense… and so just because an English translation is clearly in either the past, present, or future tense, it does not necessarily mean that this is what is implied by the Hebrew original. One often encounters the use of the “prophetic perfect”, where a prophecy of something that has not yet come to pass is in the perfect tense, and so is often translated with the English past tense, e.g. “…with His stripes, we were healed” (Isaiah 53:5), when from the perspective of the prophet, he was speaking of something in the future. 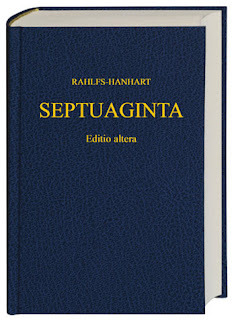 That the Septuagint is the most authoritative text in the Orthodox Church is something that is confirmed in just about any Orthodox catechetical text you could consult. The Septuagint text is the text that the Church has preserved. The Masoretic text is a text that has not been preserved by the Church, and so while it is worthy of study and comparison, it is not equally trustworthy. We have the promise that the Holy Spirit will guide us into all Truth (John 16:13), and so can indeed affirm that "Our Church holds the infallible and genuine deposit of the Holy Scriptures" ("Encyclical of the Eastern Patriarchs" of 1848).